The Dutch Psychonomic Society’s biennial Winter Conference is upon us! Here, Dutch and international members of the Society meet to discuss cutting edge research. I’ll be there to listen to all of the amazing speakers, and to present a poster on our work in speed skating. Read this post for some additional info, and for a digital copy of the poster. Is skating really unfair? Yes, even at 100m times. Two weeks ago, we published a Perspective article on how the starting procedure in racing sports could bias competitions. Some speed skating enthusiasts suggested we analyse the 100-meter times from the races we reported on. So we did! 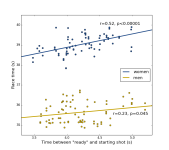 The results are very similar to our earlier results: Longer ready-start intervals lead to slower 100-meter times in Olympic speed skating. Threatening elements (think spiders) in your surroundings tend to grasp your attention more strongly than non-threatening things (think puppies). Some scientists believe that your brain is wired to notice threatening stimuli quicker, via a special sub-cortical route. 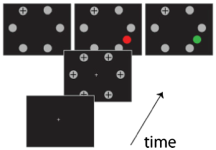 In a new experiment, we show that task-irrelevant threatening stimuli are prioritised over non-threatening stimuli, but that they are not processed any quicker. Is skating really unfair? Yes, even in extra stringent analysis. Yesterday, we reported that random variability in the starting procedure of racing sports can bias competitions, even at Olympic events. Not everyone agreed. 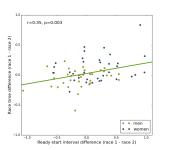 In this post we address all questions and criticisms, and provide an extra analysis that looks at within-athlete effects of changes in the ready-start interval on changes in race times. This analysis is robust to differences between skaters’ individual qualities, and has causal power. 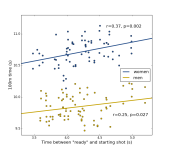 Our results indicate that there still is evidence that random differences in ready-start intervals might bias competitions. At the very least, this calls for future research into the starting procedure of racing sports. Which is exactly what we intended to provoke with yesterday’s publication. At Olympic racing sports, the gold goes to whoever is the most talented and has trained the hardest. Or does it? Our new research shows that subtle random differences in starting procedures can bias athletes’ alertness. This makes them slower to respond to the starting shot, resulting in a higher finishing time. This small bias can the difference between winning gold, and not even being on the podium! One underlying issue in psychopathy is an inability to use contextual information (e.g. the look on someone’s face) to guide attention. New research shows that psychopathic traits are associated with top-down, but not with bottom-up attention. In non-psych lingo: psychopaths are very focussed on the task at hand, and have issues in directing their attention to information that is irrelevant to said task (even if it might have helped them perform better).